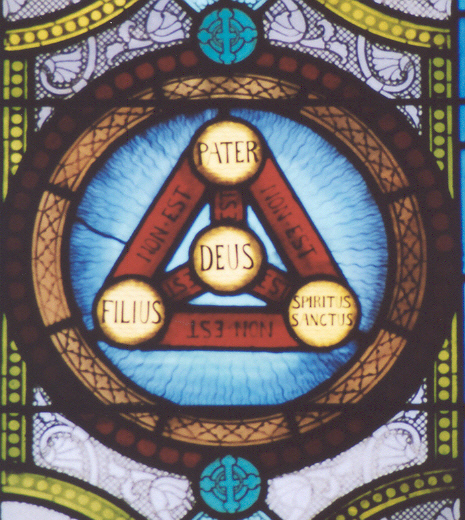 As I was reflecting on what I would include in my homily on this Solemnity of the Most Holy Trinity, I was taken back to one of the very first classes I took in the seminary, entitled, "Trinity." My instructor was a priest named Msgr. Langsfeld, and I'll never forget what he said to us on the first day of class, a group of 30 zealous and eager men ready to jump into theological studies. He said that the first thing you need to know about the Trinity is that you can't know the Trinity in the full sense. That's why it's a mystery. He said that if we could totally grasp the concept of the Trinity, then we would be God. As he looked around the classroom, he said, "Well, none of you even look like Jesus, so I'm just going to assume that none of you will be able to fully explain what we will study." The mystery of the Trinity should at once baffle us and yet engender sentiments of love within our hearts. The Jews of Christ's day were totally astounded by the revelation that not only was Jesus the Son of God - there was more - there was a Holy Spirit, who constituted the God-head along with the Father. If you examine the Scriptures, the first person to reveal that we could even call God "Our Father" was Jesus. Even Moses only knew God as "I am who am" but Moses did not know about the Son and the the Holy Spirit as we understand these persons who make up the Trinity. This is exactly what St. Paul refers to in our second reading from Romans. We cry out, "Abba - Father!" Abba is also translated as being more intimate than Father but is also understood as saying, "daddy." This implies a closeness that we can have with God the Father which to this point in salvation history, was unheard of. However, let's not take this too far. I don't want anyone calling me, "Daddy Magat." So, how should we understand the Trinity? It's a question many Christians ask. Catholic doctrine teaches that there are three persons in one God who all share the same nature. Remember that we are talking about three persons in one God; not three gods or three faces of one god. Three persons. St. Patrick of Ireland tried to explain it with a shamrock. Each section is distinct and yet each is of the same nature of "shamrockness" as the other sections within the flower. Yet the analogy falls short because the shamrock can be divided into three parts and God cannot. Here's another analogy: You can have three business partners in one venture. Each has the ability of the other two - to sell, to hire, to lease, etc. Yet, each is distinct. This gives us the idea of how three persons can share the same abilities and do all things together and yet remain distinct. Yet, this analogy falls somewhat short as well for the partners existed before the partnership and could be without it, whereas the three persons of the Trinity could never be apart from each other and whereas business partners can do things on their own, the Trinity always acts together. Even in our worship of the Eucharist - we say that Jesus is really and substantially present body, blood, soul and divinity. Where Jesus is, the Father and the Holy Spirit are not far behind. There is a special dynamic at work here: Father loving Son; Son loving Father totally and unconditionally from all eternity and the agent of love between them that is breathed forth is the Holy Spirit - not in time, but from all eternity. In prayer, we should be asking God for the grace to get caught up in the conversation between the three persons of the Trinity, to be more than a spectator, but rather - a participant in the very inner life of God. From time to time, you will hear at Mass people who take the liberty of changing the "His" to "God" and will say, "May the Lord accept this sacrifice at your hands, for the praise and glory of God's name, for our good and the good of all God's Church." We even see this in songbooks as well - the word "His" is replaced by the word "God" in order to gender-neutralize God, as if referring to God as "Father" or in the masculine form is somehow offensive. If it's offensive, then have you ever wondered why Jesus tells us to pray "Our Father" and not "Our God" or "Our Mother?" Recently, I asked the bishop what he thought about this and he stated in no uncertain terms that the word "His" must be used because while God is essentially a spiritual being, He reveals Himself to us as Father as Jesus taught us to call Him Father and this means that there is something about Fatherhood that interests God so that he wants us to know Him as Father. Mary is our Mother and she is the mother of God; the Church, which is a type of who Mary is, by analogy our mother in a similar way. The Earth is not our mother. The Earth is a planet. Planets are not persons. There are two main reasons why knowledge of the Trinity should be important to us. First, it allows us to know more and more about God and we can't love Him if we don't know Him. If we truly love God, we will be compelled to know more and more about who He is, not merely who we imagine Him to be. If we truly love God, we more easily desire to hear His voice, not merely our own. God shows us who love is. When we say that God or the Trinity is love, what we are really saying is that love is not merely an aspect of God. Rather, love IS who God IS in Himself - three persons loving each other in totality. It's not as if God created us and then inserted love into the picture. Rather, the love within the Trinity was there from all eternity and in this love, everything else was created. The second reason why knowledge of the Trinity is important for us is that it allows us to know more about ourselves and who we should be. Since we are created in God's image, the Trinity reveals that we are meant to be in relation with other persons. We were created to love and to be loved. Being in relation is part of what it means to be human. I was at Home Depot the other day buying some supplies and I used the automatic checkout where I had to follow the instructions of this checkout machine who has that voice that you hear on every computer-generated answering machine. You know the voice. It's haunting - she's everywhere. I was at first thrilled by the fact that I could do this all by myself and yet I walked away feeling empty. I went through the entire Home Depot without really having had any interaction with any other person. We need to guard against this de-personalization of modern living; the Trinity shows us that we were created to be in relation. Lastly, the Trinity reveals to us that love is at the essence of each person's calling and our vocations to marriage, the single life or to the priesthood and religious life are the deepest way of living out that love. It started for us at baptism and is re-cast each time we celebrate the Sacraments of Penance and Holy Eucharist. To close on this when we also celebrate Fatherhood, I would be remiss if I did not spend at least a minute addressing our fathers here present. I'd like to close with a story that some of you have heard me tell before but I think bears repeating. There was a priest in the Archdiocese of Denver who was reminiscing about his childhood and his relationship with his father. Of all the wonderful memories he had about growing up in a middle-class, blue collar family in Denver, one memory would always stand out. When this future priest was 18 years old and just finishing high school, he asked his father if he could go out with his buddies one Friday night to hang out. His father agreed but warned him that the curfew rule still applied - in by midnight, was the rule. The young man agreed. Unfortunately, the young man did not uphold his end of the bargain - he stayed out past 6 in the morning. As he was walking up the driveway to his home just past 6 a.m., his father was heading out the door to work, since he worked on Saturdays to make ends meet. His father was furious but all he said was, "You're grounded - bread and water for dinner for the next five days!" Later in the afternoon, the father returned from a long day of work and the family gathered around the table for supper, said the blessing and began to eat. Each of this future priest's siblings and his mother and father had heaping plates of food placed in front of them while the young man got what he expected - bread and water. But before he could start on his meager meal, he noticed his father at the other end of the table, get up, take his own plate of hot food and place it in front of his son to eat. Meanwhile, the father took his son's bread and water and began to eat it himself. The son was shocked. He asked, "Why did you do that?" The father replied, "Because that's how God the Father loves you, even when you disobey Him" Suffice it to say that this future priest never forgot the meaning of God the Father's love for each of us and just exactly how much He loves us - so much so, that he gave up his only Son to die for our sins. It is my prayer that each of the fathers here present will aspire to live up to the great challenge that our heavenly Father issues to each of us by His omnipresence, His selflessness, Him humility and His paternal care. We pray, too, on this day, for all of our deceased fathers - may they rest in peace. May each of us live our lives in a way that befits the legacy of faith that our fathers have left us to enjoy and one day, may we all see the most lovable face of our heavenly Father in eternal glory.